I was first introduced to this dish by Deanna Fitchat, owner of Deelicious Park City. She created a fantastic menu for the Next Course, called the Perfect Picnic. I have made them once a week since and they never fail to delight. No filler (breadcrumbs), just pure flavor. Easy to make (10 minutes in the oven). Great for a quick and tasty dinner, leftovers for lunch or a picnic. 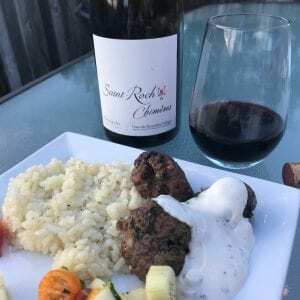 The wine pairing for this dish is a Cotes de Roussillon Village Grenache Syrah blend. The bottle I chose is called St. Roch Chimeres and is rated 92 points. Wine pairing is by Rebecca Goodpasture. 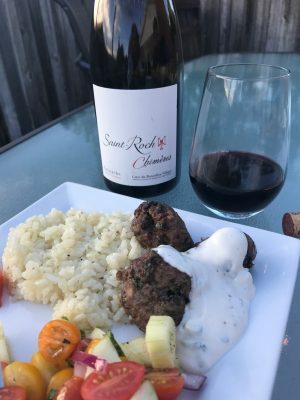 Easy and delicious, these meatballs will be your go to for meals on the go or entertaining a crowd. For the lamb meatballs: In a large bowl, combine the ground lamb, fresh mint, spice rub salt, and red onion. Mix together with your hands until thoroughly mixed and slightly sticky. Form mixture into 12 balls, approximately two inches wide. Adjust top oven rack to six inches below the broiler. Preheat broiler to high. Add oil to rimmed baking sheet. Add the meatballs, and roll them around until they are coated in the oil. Arrange in two rows in such a way that they will cook evenly under the broiler element. Transfer pan to the broiler, and cook until meatballs are browned on the top, 4 to 5 minutes. Carefully remove the pan, and use a pair of tongs to flip the meatballs. Return pan to the oven, and cook until browned on the other side, another 4 to 5 minutes. Remove and set pan aside. For the yogurt and pomegranate sauce: In a medium bowl, whisk together all ingredients. Season to taste with salt and pepper.